bNeurology (J.-P.S., K.L.Y., C.H. )cthe Institute of Neuroimmunology and Multiple Sclerosis (J.-P.S., K.L.Y., C.H., S.S.), University Medical Center Hamburg-Eppendorf, Hamburg, Germany. aFrom the Departments of Diagnostic and Interventional Neuroradiology (S.G., D.K., J.F., S.S.)cthe Institute of Neuroimmunology and Multiple Sclerosis (J.-P.S., K.L.Y., C.H., S.S.), University Medical Center Hamburg-Eppendorf, Hamburg, Germany. BACKGROUND AND PURPOSE: Identification of lesions in specific locations gains importance in multiple sclerosis imaging diagnostic criteria. In clinical routine, axial scans are usually exclusively obtained to depict the cervical spinal cord or used to confirm suspected lesions on sagittal scans. We sought to evaluate the detection rate for MS lesions on axial T2WI scans with full spinal cord coverage in comparison with sagittal scans. MATERIALS AND METHODS: One hundred fifteen patients with definite or suspected MS underwent an MR imaging examination including 3-mm sagittal and 3.5-mm axial T2-weighted images with full spinal cord coverage. T2WI lesions were identified on axial and sagittal scans independently by 2 raters. Axial diameter, craniocaudal extension, lesion intensity, and location were analyzed. RESULTS: Four hundred forty-nine of 509 (88.2%) lesions were detected on axial and 337/509 (66.2%) on sagittal scans. Only 277/449 (61.7%) axial lesions were also detected on sagittal images. The number of lesions visible on sagittal and axial images was dependent on the axial lesion diameter (P < .001). CONCLUSIONS: Axial T2WI scans with full spinal cord coverage showed 22% more lesions in patients with MS in comparison with sagittal scans, especially for lesions with small axial diameters. We suggest including biplanar spinal MR imaging with full spinal cord coverage for lesion detection in MS in clinical routine and for clinical studies. Spinal cord abnormalities seen on MR imaging were incorporated into the McDonald Diagnostic Criteria for MS in 2005.7,8 Since the revision of the McDonald Diagnostic Criteria for MS in 2010,9 they have gained even more importance because better spinal cord lesion detection potentially impacts the recognition of the dissemination of MS lesions in space. In 2006, a consortium of MS centers published consensus guidelines with a standardized MR imaging protocol for spinal cord imaging in MS, recommending a 3-plane scout; a pre- and post-contrast-enhanced sagittal T1; a pre-contrast-enhanced sagittal FSE proton-density/T2; and additionally, only in case of suspected lesions, a pre-contrast-enhanced axial FSE proton-density/T2 and a post-contrast-enhanced axial T1.10 In the clinical routine of MS diagnostics, axial scans are typically obtained exclusively with coverage of the cervical spinal cord or are used to confirm suspected lesions in sagittal scans. This is mainly due to the long scanning time of axial scans with full spinal cord coverage. We hypothesized that axial T2WI scans with full spinal cord coverage would detect more T2WI lesions in comparison with sagittal scans. We sought to evaluate detection rates for T2WI lesions on axial and sagittal scans in relation to the distribution and extent of spinal cord lesions in patients with MS. To our knowledge, this is the first study focusing on the clinical application of axial 3.5-mm scans with full spinal cord coverage. We used a sequence with reasonable duration, feasible in clinical routine. One hundred fifteen patients (81 women, 16–82 years of age; mean, 38 years; 34 men, 16–71 years of age; mean, 38 years) with diagnosed or suspected MS, and clinically suspected or known spinal cord lesions were consecutively included in our study between April 2013 and February 2014. Patients were referred for MR imaging by our associated MS day hospital. The prospective study was approved by the local ethics review committee and is in accordance with the Declaration of Helsinki. Patients or their guardians provided written informed consent. All patients underwent an MR imaging examination of the spinal cord, including axial scans, with full spinal cord coverage. All examinations were performed on a 3T MR imaging scanner (Magnetom Skyra; Siemens, Erlangen, Germany) with a neck and spine multiarray coil including, among other sequences, an axial T2WI turbo spin-echo sequence (TR, 6600 ms; TE, 94 ms; FOV, 200 mm; section thickness, 3.5 mm; 50 sections without a section gap; acquisition time, 2 minutes and 53 seconds) in 2 slabs with full spinal cord coverage (including the tip of the odontoid process and the conus medullaris) and a sagittal T2WI turbo spin-echo sequence (TR, 3650 ms; TE, 95 ms; FOV, 300 mm; section thickness, 3 mm; 17 sections without a section gap; acquisition time, 1 minute and 55 seconds). An intersection cross-talk was avoided by interleave acquisitions. Lesions were defined as macular signal alterations with a minimum axial diameter of 2 mm that could be clearly isolated from their surroundings and not mistaken for artifacts. Axial and sagittal T2-weighted images were analyzed by 2 experienced neuroradiologists on a medical workstation on calibrated, high-resolution monitors. In a first reading, sagittal scans were presented to both raters separately in random order and MS lesions were identified and marked by each rater. In a second reading, corresponding axial scans were presented to both raters in the same manner. There was an interval of 2 weeks between the readings. For both readings, raters were blinded to the patient name and all other clinical and imaging parameters, especially to rating results and images of corresponding axial or sagittal scans. The readings were performed with the same intensity windowing to ascertain comparability between raters and scans. After completion of the blinded reading, lesions that were found only in axial or sagittal scans were reevaluated and documented to assess whether the lesion could be identified retrospectively in the corresponding axial or sagittal plane. Each lesion was characterized according to its intensity, location in the axial plane (midline or lateral), and position (cervical or thoracic) following the blinded reading. In addition, the craniocaudal extension (CCE) and axial diameter (AD) of each lesion were documented. To assess lesion extension in the axial plane, we measured the maximum lesion diameter, and lesions were stratified accordingly: AD1, 0.2–0.3 cm; AD2, 0.3–0.5 cm; AD3, > 0.5 cm. Lesions were grouped according to their intensity (I1 = low intensity, I2 = intermediate intensity, I3 = high intensity relative to CSF). The interobserver agreement for T2 lesion detection in axial and sagittal scans was evaluated with the Cohen test, and magnitude guidelines were applied according to Landis and Koch.17 For further analysis, only lesions identified by both raters were included. Ordinal data were evaluated by using the χ2 test. All statistical analyses were conducted by using R statistical computing software, Version 3.0.0 (http://www.r-project.org/). Ratings for detection of lesions on sagittal and axial scans for raters 1 and 2 are shown in Table 1. Both raters detected more lesions on axial than on sagittal scans. The Cohen κ value for interrater reliability was almost perfect (κ = 0.841) for lesion detection in axial and sagittal scans and only slightly lower (κ = 0.804) for sagittal scans (Table 1). In total, 509 lesions were detected on axial or sagittal scans by both raters. Four hundred forty-four T2WI hyperintense spinal cord lesions were identified on axial scans, and 284 lesions, on sagittal scans during the first reading (Table 2). When scans were evaluated retrospectively, the number of lesions that were missed in the first but identified in the second reading was considerably higher on sagittal in comparison with axial scans (Fig 1). Overall, 449/509 (88.2%) lesions were detected on axial scans, while 337/509 (66.2%) lesions were detected on sagittal scans. 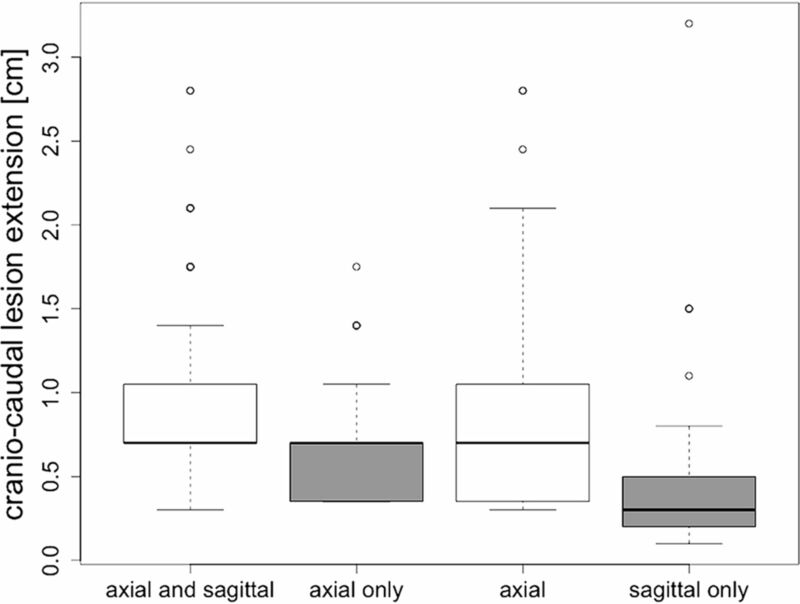 Of all lesions detected on axial scans, only 277/449 (61.7%) were also detected on sagittal scans, while 60/337 (17.8%) were detected only on sagittal scans without any correlation on axial scans, even in retrospective evaluation (Fig 1 and Table 2). Sample images are shown in Figs 2 and 3. The median number of lesions identified per patient was 2 (minimum, 0; maximum, 22 lesions). In 31/115 (27%) patients, no spinal cord lesion was identified by both raters. In the 84/115 (73%) patients with at least 1 detected spinal cord T2 lesion, the median number of lesions was 6, with a minimum of 1 lesion per patient and a maximum number of 22. 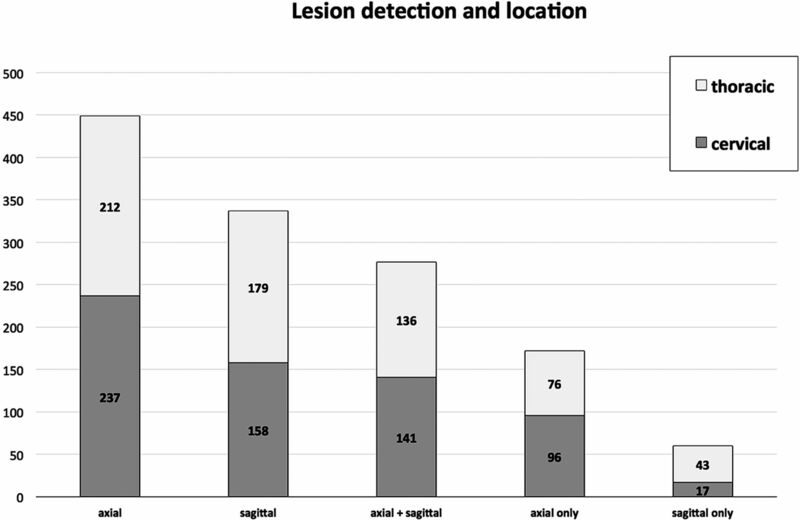 Graph displaying the total number of lesions detected on axial scans (axial), the total number of lesions detected on sagittal scans (sagittal), the number of lesions identified on both sagittal and axial scans (axial + sagittal), and the lesion number marked on axial (axial only) or sagittal (sagittal only) scans only without corresponding correlates in the other plane. 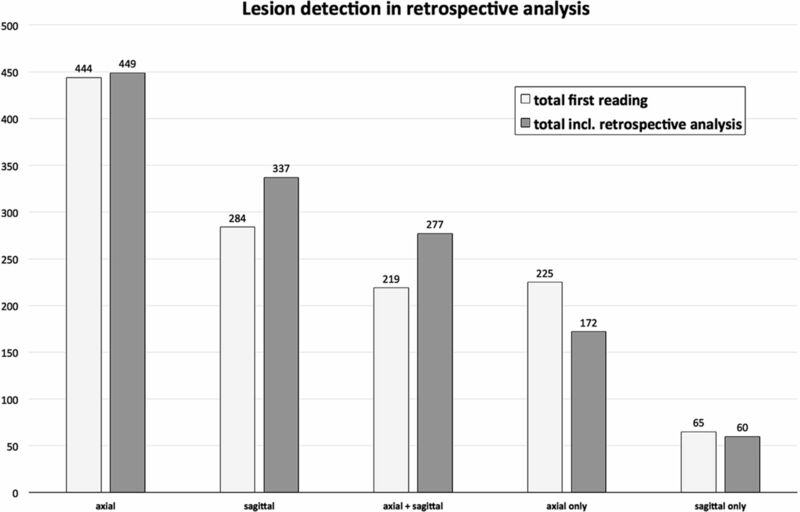 Light gray bars indicate the results of the first reading, and dark gray bars correspond to lesion numbers, including the lesions that could only be identified when retrospectively analyzing the images. Incl indicates including. Examples of a cervical (1A and 1B) and a thoracic (2A and 2B) spinal cord lesion detected on axial scans but missed by both raters on corresponding sagittal scans. Examples of spinal cord lesions detected only on sagittal scans (A) while missed on corresponding axial scans (B and C). There was no significant difference in the number of lesions located in the cervical or thoracic spinal cord (P > .2) on axial or sagittal scans. The number of lesions detected only on sagittal but not on axial scans was significantly higher within the thoracic spinal cord than in the cervical cord (P < .001) (Fig 4). On axial scans, 185/449 (41.2%) lesions were located in the midline of the spinal cord, 128/449 (28.5%) on the left side, and 136/449 (30.3%) on the right side. The rate of axial lesions also recognized on sagittal scans was significantly higher for lesions with an in-plane location in the midline (126/185, 68.1%) than for lesions with a lateral location (151/264, 57.2%, P > .001). There was no significant difference in the number of lesions located in the cervical or thoracic spinal cord (P > .2) on axial or sagittal scans. The number of lesions detected only on sagittal but not on axial scans was significantly higher in the thoracic spinal cord than in the cervical cord (P < .001). In addition, lesion identification did not seem to be dependent on the degree of lesion intensity. Lesions with high intensity on axial scans were also identified on sagittal scans in most cases, but the percentage of lesions with low intensity (I1) identified on axial and sagittal scans was only slightly lower in comparison with those with high intensity (I3) and slightly higher than the percentage of lesions with medium intensity (I2) (On-line Table). The percentage of lesions detected on sagittal and axial scans seemed to be dependent on the axial lesion diameter. The larger the lesions, the higher were the percentages of axial lesions also detected on sagittal scans. Forty of 43 (93.0%) of the lesions with an axial diameter >0.5 cm (AD3) were also identified on sagittal scans, while only 49/106 (46.2%) lesions in group AD1 were also detected on sagittal scans (On-line Table). When we compared the CCE of lesions, lesions that were detected on axial and sagittal scans showed significantly larger CCEs (P < .001) than those lesions that were only identifiable on axial scans (Fig 5). Thirty-eight of 60 (63.3%) lesions only identified on sagittal scans presented with a CCE ≦ 0.3 cm. Boxplot comparing craniocaudal extension of lesions. Those lesions detected in axial and sagittal scans had a significantly larger extent (P < .001) than those lesions that were only identifiable on axial scans (axial only). The present investigation is the first MR imaging study using axial T2WI sequences with full spinal cord coverage in a cohort of patients with possible inflammatory spinal cord pathology from an MS clinic, to our knowledge. We compared the lesions found in sagittal and axial scans in number, location, signal intensity, and size by using the AD and the CCE. The overall acquisition time for a combined imaging study consisting of 2 slabs of axial T2WI scans (2:53 minutes) and sagittal T2WI scans (1:55 minutes) seems reasonable even for a routine clinical setting. Previous studies gave the impression that focal spinal cord lesions in patients with MS are preferentially located in the cervical spinal cord.19⇓⇓–22 In 2004, Bot et al4 published a study with 353 spinal cord lesions in patients with MS; 56.4% of these were located in the cervical spinal cord. In line with these previous studies, 52.7% of all spinal cord lesions detected in our study were located in the cervical segment. Notably, the percentage of lesions identified in the cervical spinal cord only slightly exceeded the percentage of thoracic lesions (47.3%). Nevertheless, in both segments, cervical and thoracic, significantly more lesions were detected in the axial than on the sagittal planes. Our findings demonstrate that the standardized MR imaging protocol for spinal cord imaging in MS, which recommends axial scans of suspicious lesions on sagittal planes only,10 leaves a high percentage of lesions undetected. In addition, the common clinical procedure to cover the cervical spine with an additional axial sequence seems to disregard, specifically, thoracic lesions. In line with authors of previous MR imaging and pathologic studies, we found lesions only infrequently in the anterior columns of the spinal cord.26⇓–28 In addition, most of the detected lesions on sagittal and axial planes were located in the lateral columns of the spinal cord. Lateral cord lesions were likewise detected on sagittal scans in only 57.2% of the cases. Reasons for missing lesions on sagittal scans might be the section thickness of 3 mm and partial volume effects. The lesion signal intensity did not seem to affect the likelihood of lesion identification. However, in some cases, lesions were more clearly identified on axial scans and only depicted as diffuse hyperintensities on the sagittal spinal cord images. This phenomenon has already been described in detail on postmortem MR imaging and histopathologic analyses.29 Without knowledge of corresponding axial scans, these lesions have been mainly considered artifacts. A major limitation of this study in line with previous studies that compared MR imaging sequences for lesion detection30 was the lack of a reference standard for lesion presence. In the absence of postmortem pathologic data, which serve as the only reliable reference, we used consensus findings of 2 experienced raters in axial T2-weighted TSE images with full spinal cord coverage as a radiologic reference standard and compared these results with lesion detection on sagittal planes. In general, lesions were more clearly detectable and defined on axial than on sagittal T2WI scans. Therefore, we regarded axial scans as more reliable for lesion detection than corresponding sagittal scans. However, lesions identified only on sagittal scans might be missed because of their CCEs lying below or being equal to the section thickness of the axial sections. The current diagnostic value of sagittal spinal MR images is limited mainly by partial volume effects, CSF pulsation artifacts, and section thickness of 3 mm, resulting in a high number of lesions missed by the reader. Nevertheless, the sagittal scan should not be abandoned because lesions with small CCEs can also be missed on axial scans with 3-mm section thicknesses. Furthermore, when we retrospectively evaluated lesions that were only seen on axial scans in the first reading, 26.5% more lesions could be identified on both scans after the second reading and might therefore be regarded as reproducible. 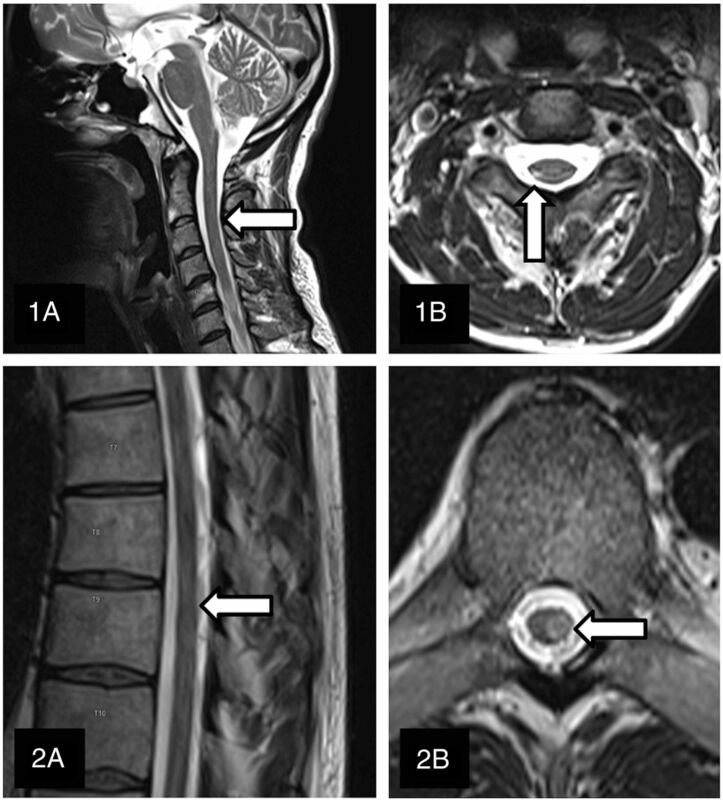 In patients with MS, axial scans with full spinal cord coverage displayed considerably more T2WI lesions in comparison with sagittal scans in the cervical and in the thoracic spinal cord. This finding applies especially to lesions with a small axial diameter and lesions located in the lateral spinal cord. However, even large lesions can be overlooked when only assessed in the sagittal plane. Furthermore, axial scans with full spinal cord coverage allow quantification and volumetric analysis of spinal lesion load in patients with MS and might provide a new impulse for future MS studies. 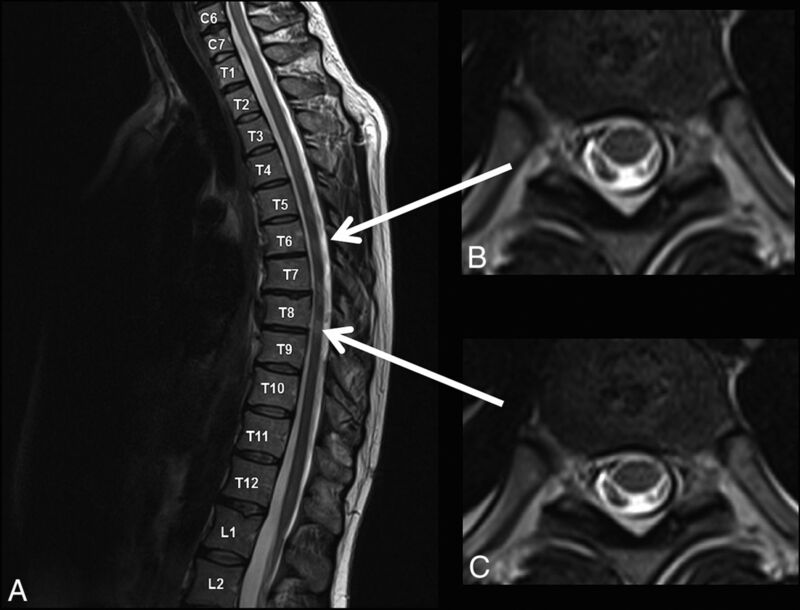 We suggest biplanar spinal MR imaging with full axial spinal cord coverage as a comprehensive examination for lesion detection in MS in clinical routine and for clinical studies. The clinical implication of these additional findings needs to be confirmed and validated in future studies. Disclosures: Stephanie Galler—RELATED: Grant: Federal Ministry of Education and Research,* Comments: S.S., J.-P.S., C.H., Proposal/Contract 0315610–0315620 NEU2. Jan-Patrick Stellmann—UNRELATED: Grants/Grants Pending: Biogen,* Merck Serono*; Payment for Lectures (including service on Speakers Bureaus): Biogen*; Travel/Accommodations/Meeting Expenses Unrelated to Activities Listed: Biogen, Novartis. Kim Lea Young—RELATED: Grant: Federal Ministry of Education and Research. * Daniel Kutzner—RELATED: Grant: Federal Ministry of Education and Research. * Christoph Heesen—RELATED: Grant: German Ministry of Education and Research,* Comments: Grant to develop MRI platform for MS as an outcome for treatment studies. Jens Fiehler—UNRELATED: Payment for Lectures (including service on Speakers Bureaus): Siemens. *Money paid to the institution. This study was supported by the Federal Ministry of Education and Research (S.S., J.-P.S., C.H. ; Proposal/Contract 0315610–0315620 NEU2). Accepted after revision November 3, 2015.